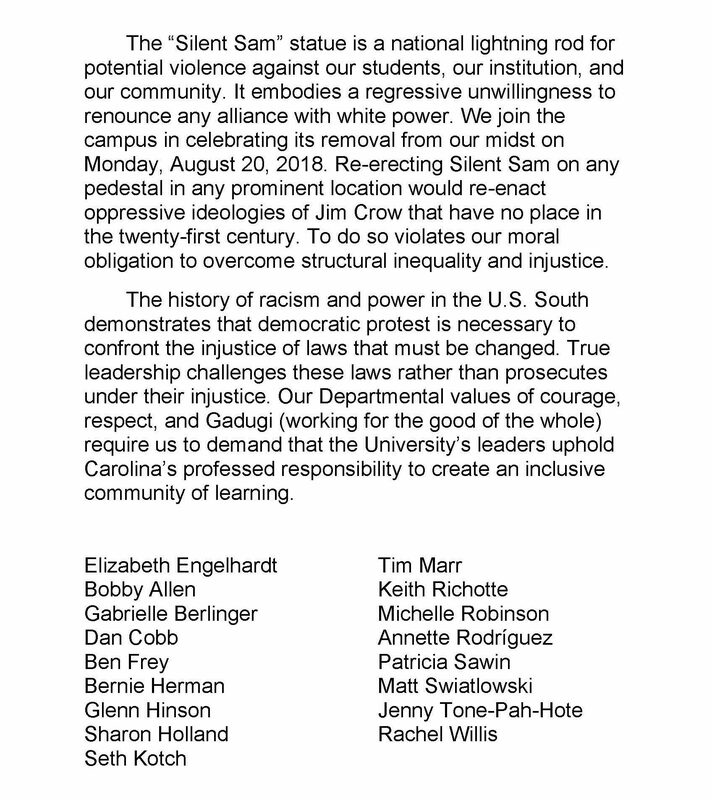 It is our University’s moral duty to remove “Silent Sam” so that the racism it represents no longer affronts the principles we strive to uphold. The statue was intended to stand as a symbol of white supremacy. The dedication in 1913 is unequivocal on this deeper purpose: “the confederate soldier…saved the very life of the Anglo-Saxon in the South.” The monument celebrates the disenfranchisement and segregation of American citizens who sought the full rights of citizenship. This racist artifact has stood for over a century at the heart of our campus. We call for a continuing substantive and vocal commitment to inclusivity, equal rights, and academic freedom. The American Studies Department stands for the principles of respect, courage, and Gadugi-Cherokee for working together for the common good. These principles guide our conviction that no place should be provided for “Silent Sam” on our campus.